We’ve met some really wonderful people in Baltimore, people who have become our friends and made this city feel like home. We met Bill and Jen, and their daughter Finley, through Dan’s work, and we’ve loved getting to know them. Jen also has southern roots, which means we can gush over grits and biscuits and collards and all the things our Yankee husbands never understood about vegetables before meeting us. I love having friends that I can gush with about collards. 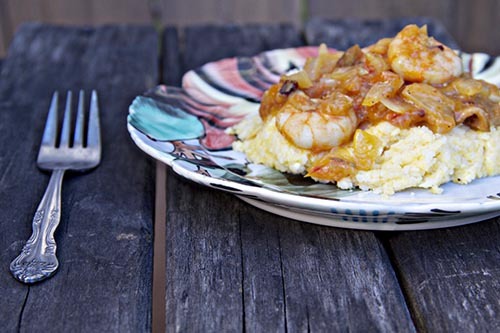 Last night they came over for dinner and I made shrimp and grits, but deviated a bit from my usual recipe. I wanted to make a dish that highlighted the beauty of the last of the summer tomato, I thought it fitting to serve something featuring the giant, beautiful, bursting with flavor tomatoes that will soon disappear from the market on the first day of fall. So the tomatoes were slow roasted in a brown butter brown sugar base for about an hour. And then they were mixed into onions that had been caramelized in bacon drippings, just a hint of hot sauce, and plump shrimp. All of that got scooped over creamy cheesy grits, the perfectly salty pair to the slightly sweet slightly spicy tomato sauce. They were pretty delicious. We ended the meal with pumpkin bread pudding, vanilla ice cream, and a serving of Pumking. It was the perfect combination of late summer and early fall, a meal I feel very lucky to have shared with such wonderful friends. In a heavy pan melt butter and brown sugar over VERY low heat. When the butter has browned add in tomatoes, and stir well. Simmer on countertop for 15-20 minutes, and then roast in a 300 degree oven for an additional 20. In another, larger, pan (this is where having a cast iron collection comes in handy) cook bacon. Set aside. Dice onions and cook in bacon drippings over low heat. When the onions are caramelized add in the crumbled bacon, hot sauce, and tomato mixture. Add in seasoning. Continue to simmer. Clean and peel shrimp. Boil until just barely pink, and then strain and add to the tomato sauce. Simmer all together for an additional 20-30 minutes. While the sauce is simmering, bring heavy cream and water to a slow boil. Stir in grits and continue stirring as the grits thicken. 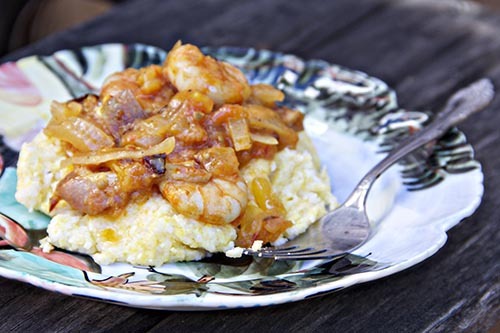 Once the grits are thick remove from heat and stir in milk, cheese, spices, and lemon juice. Mix together well, cover, and let sit. 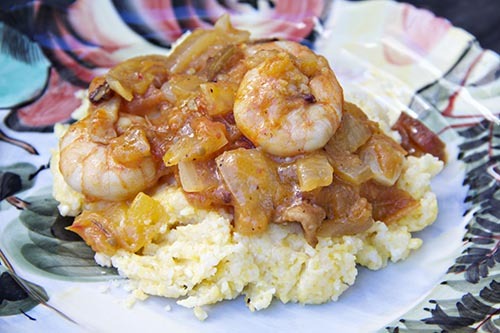 Serve a healthy amount of grits topped with a few big scoops of the sauce to your patiently waiting, hungry and excited, dinner guests. that looks incredible! makes me think of wonderful meals I had in Asheville. Thank you SO much for making this for us, Elena. Anyone reading these comments, this recipe? TO DIE FOR. It’s been forever since I’ve had grits that actually make me want to jump up and smack my mama, and I’m so honored that you made this for us. Also, I will make this often (and maybe once or twice with collards on the side! ).